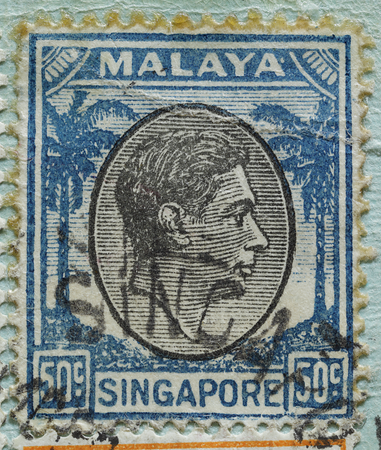 Sometime in the year 1948, a stamp dealer in Singapore was offered a batch of fake high-value coconut definitives. 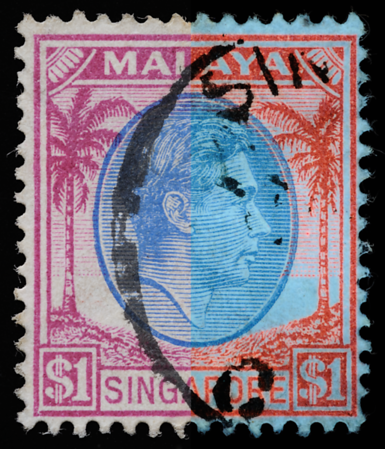 Cheap reproductions of expensive stamps were often sought by poor collectors to fill their albums. But the dealer rejected it, wanting nothing to do with imitations. The vendor, on a spur of the moment, decided to try his luck offloading the stockpile on a postal clerk working in a large company. Taken by the low price and not realizing the stamps were fakes, the clerk bought them over and used them. Before anyone knew it, they had gone through the post. It sparked off a police investigation and shook the postal world. The pieces of paper that had started out as insignificant philatelic reproductions suddenly became famous and bizarre postal forgeries. 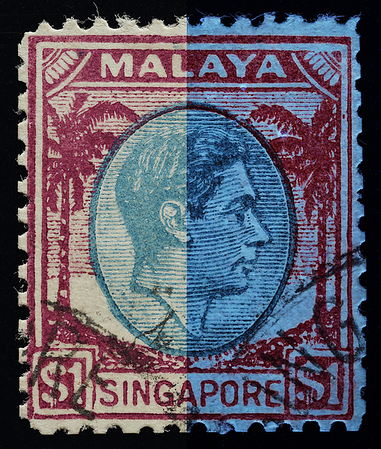 This hypothetical chain of events has never been proposed before, but a 1971 article in New Nation uncovered by the author contained a sentence that hinted at the tantalizing possibility: "It is believed that a Singapore stamp dealer was first offered these stamps, but he did not buy them and it was presumed that they were then sold to a postal clerk of a commercial house and used by him on the firm's mail." Initial reports of the postal forgeries listed only the 50 cents and $2. A Reuters wire story on 30 June 1949 noted that many of the forgeries might have been tipped into wastebaskets by unsuspecting recipients of mail, and asked "why such clever forgers should waste time on stamps of so low a value". It also cited the ease of imitation of particular colours as a possible reason for the two denominations chosen. The examples shown here were formerly in the collection of the late Graham Cooper FRPSL and were briefly documented by Cooper (1982, 1992). In the following year Mr Foster loaned an example of the $1 forgery to the Singapore police, who also said they had traced the forgeries to two banks (Duberal 2001) that were thought to be using them innocently (The Straits Times, 30 June 1949). 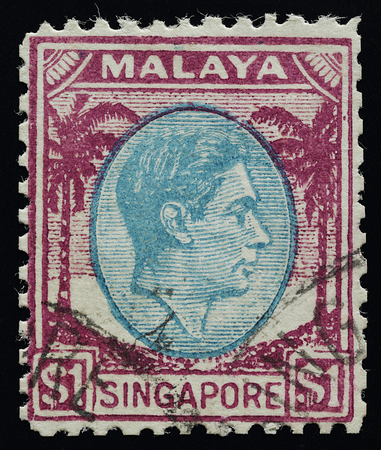 Although the police had been unable to ascertain whether the forgeries had been made in Singapore, they said a special check had been introduced to prevent further use of the forgeries. 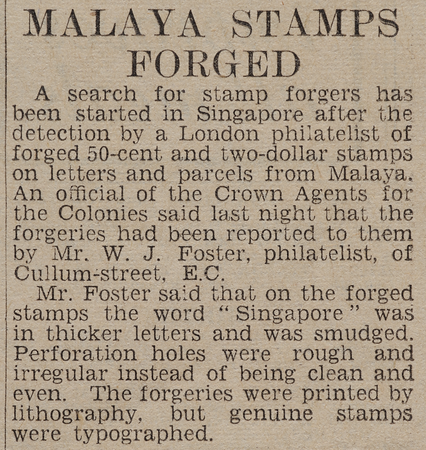 Weirdly, the postal authorities in Singapore were reported to have begun investigations in 1955—half a decade later—as revealed on the 8 July cover page of The Straits Times that year (Colony stamp forgery). 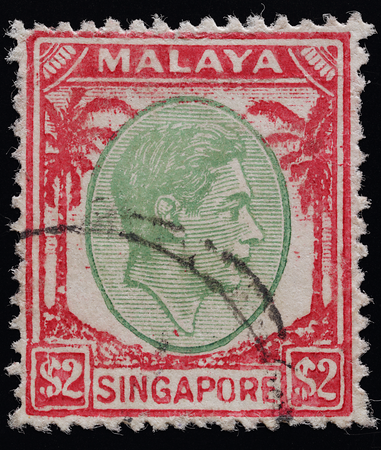 According to the report, three $2 forgeries had sneaked through post offices in Singapore and London before a dealer spotted them—without their envelopes—among a pile of used stamps. In 1964, the three forged denominations were briefly reported by a Mr. Maguire in GEOSIX (vol. 29 p. 42). The author counts at least six copies of the 50 cents, two of $1 and twelve of $2 in existence, based on Norris (1981) and the author’s collection. Mr Foster reportedly encountered more than 100 pieces of the $2 but sold them off cheaply thinking they were normal stamps damaged by water (Stamp Collecting 1949, The Stamp Lover 1949). 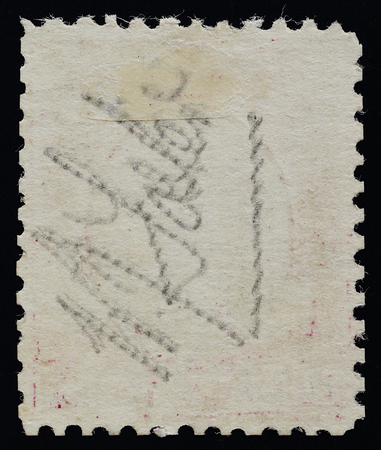 Jordan (1954) reported pairs and a strip, saying this indicated that the forgeries had been produced in sheets. Curiously, Fletcher in 1977 listed only the $2 in his survey of postal forgeries of the world. The $1 seems to be the rarest; even the Royal Philatelic Collection did not have it in 2001 (Duberal 2001). Rogers (1999), however, said the 50 cents was "scarcer" than the other two. The maverick in the pack, the $1 forgery has abnormally large perforations. Either the perforations were punched out of the straight edge of the paper, or the stamps were separated with scissors after the holes had been made. On the back is what appears to be the signature of W.J. Foster. 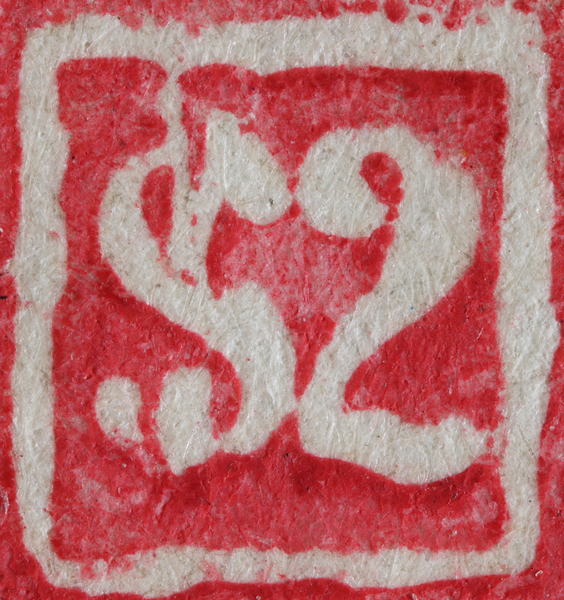 The forgeries are lithographed on unwatermarked thick wove paper. Jordan (1954) was of the view that the quality of the forgeries suggested "the use of a poor lens in the camera or an inexperienced photographer". 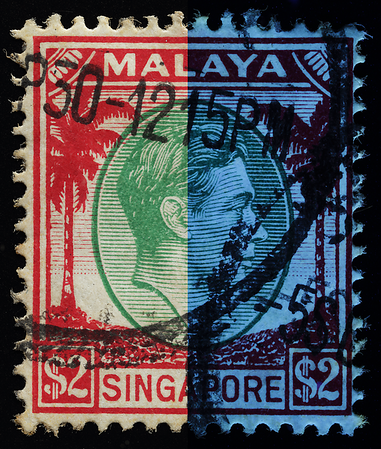 The forgery (right) fluoresces (methodology) with the "volcanic lava" of aniline inks under 365 nm longwave ultraviolet radiation (right half of stamp), but not as much as the real $1 (left). The 50 cents and $2 forgeries. The $2 is slightly wider than normal. The crude perforations were thought to have been made with "pins stuck in a stick" (Stamp Collecting 1949). Registration varies as in the real ones; this $2 (right) has a slightly levitated vignette. The Reuters story stated that the details of the king's face might have given away the fraud, but the author considers the inadequacies of the duty plate to be more conspicuous. The daughter of Penny Black designer Rowland Hill said it was much easier to detect forgery in facial features than in a coat of arms or other ornament (Mackay 1965), but it appears that the 1948 forgers surpassed that one. 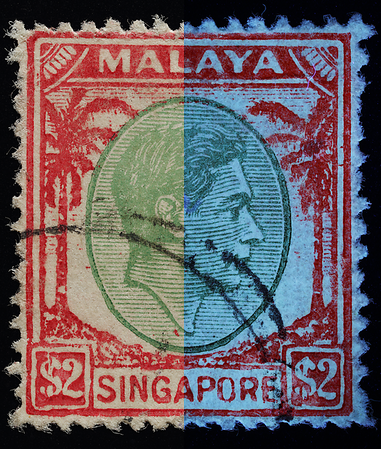 While the red ink of the real $2 (left) does not fluoresce under longwave ultraviolet (right half of stamp), that of the forged stamp (right) fluoresces with "volcanic lava". Furthermore, the paper of the forgery fluoresces less blue. Based on a detailed analysis of multiple copies of the 50 cents (not including the author's copy) and $2, and one copy of the $1 (not the author's copy), Norris (1981) reported that the forgeries were most probably produced in a relatively unsophisticated back-street outfit where the same key plate and duty plate were used for all values. The duty tablet could have been erased and changed after printing one denomination, progressive plate wear being observed with increasing denomination. The forgeries in the author’s possession, however, show a number of distinct differences in the details of the duty plates that are inconsistent with progressive plate wear in any sequence of denominations. Some of these differences were listed by Norris (1981) as well. In the author’s opinion, the five points of similarity listed by Norris (1981) do not rule out separate duty plates, as one would expect multiple duty plates made from the same source pattern to be largely similar. A crude impression and puddling of ink—probably the consequence of low-quality lithographic plates and watery ink. On the 50 cents and $1 (above) the duty plate has a partial vignette frame, possibly to guide registration. This partial frame is absent on the $2 and on real stamps. In many places on the forgeries the accumulation of ink on the edges of printed areas gives an impression of letterpress printing, but the edges are not quite crisp enough. 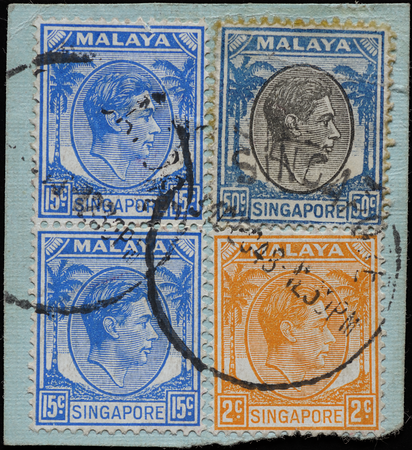 Like the BMA 50 cents forgery, the Singapore ones are crude by world standards for postal forgeries, but they were enough to fool the post. In comparison, the work of the legendary Jean de Sperati has tripped up many a philatelic expert. 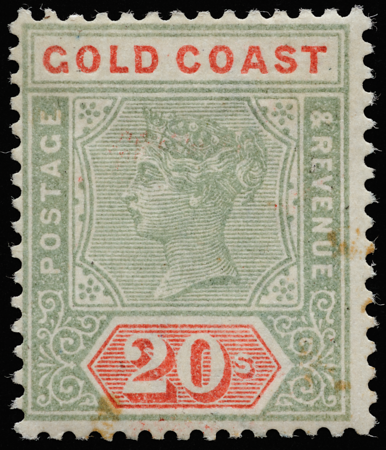 One example is the rare photolithographed forgery (right) of the equally rare letterpressed original, the Gold Coast Imperium high-value 20 shillings green & red (left). 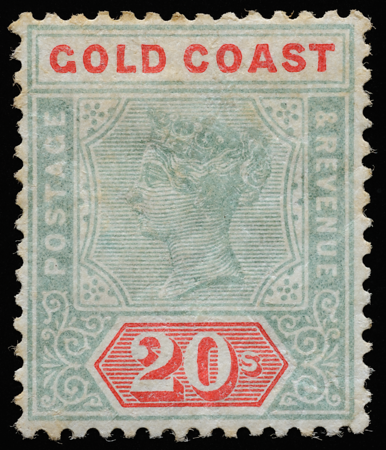 The issue was famously withdrawn from circulation when a large portion of the stock was stolen in April 1893. You might think that postal fraud is much harder to pull off nowadays, but no. Royal Mail, for example, loses millions of pounds every year to stamps counterfeited using colour photocopiers and stamps chemically treated in huge batches to remove postmarks.